My parents met in the Army. Not only was my mother in the military, but each generation of her family has been involved in major conflicts going back to the Revolutionary War. I am proud of my military ancestors who served for our freedom. Samuel Hunt deposed that after Sarah Row was married he saw her in John Leigh’s house, where he asked her for some oil. Leigh replied that the town had given liberty to a company of ugly fishermen to come into town, but they were not any better for their coming but a hundred pounds worse. Leigh was very angry and walking to and fro, the woman sitting in a chair before the fire, weeping, etc. I hard Sarahs owne mother say to her Sarah have a care what you do: be sure you can loue him: if you can loue him tacke him: and do not say that I prswaded you: its you that must liue wth him and not I: therefor be sure you loue him and her mothr was very seariouse wth her. How refreshing to see such words of encouragement from our ancestress, who is ensuring her daughter is marrying for the right reasons. One must ponder why Sarah proceeded with the marriage when she clearly still had feelings for John Leigh. If only she had heeded her mother’s advice, much misery would have been avoided. Without it, however, we would not have been given Samuel and Grace (Beamsley) Grave’s deposition in which they state “Thomas Day our Cousin that married her sister,” a clue that there is likely a relationship between the Grave(s) family that had hailed from Stanstead Abbotts, Hertfordshire, the same place where Thomas’s father Robert had lived. Thank you Ancestry.com for a Day family reunion! Ancestry.com – great for finding our ancestors, and spectacular for making cousin connections. On February 2, 2014, I sent a message through Ancestry.com to Sherece Lamke, whose family tree contained information on Aaron Day and his wife, Martha. What ensued after that initial contact was a flurry of emails back and forth, as we joyously exchanged information. Sherece, who was significantly further along on tracing her Day family lines, generously shared with me the findings of consultants whom she’d paid to help break down brick walls. Together, over the last 1 1/2 years, we’ve taken that initial research and have solved additional puzzles, having a blast along the way! I’d hoped that one day we’d get to meet, and that day finally came! 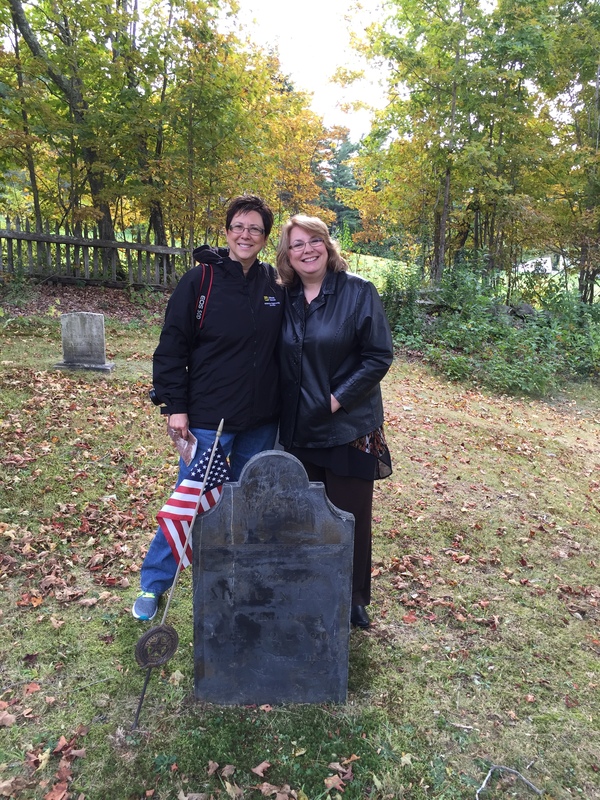 Last Friday Sherece, accompanied by her mother and aunt, met my son and I in the small town of Readfield, Maine, starting off at the Case Cemetery, where our 5th great grandfather, John Day, is buried. Jeremiah Day of Ipswich – Cabinetmaker? ?